Don't Worry, Be Happy" was released in September 1988, and became the first a cappella song to reach number one on the US charts. At the 1989 Grammy Awards, "Don't Worry Be Happy" won the awards for Song of the Year, Record of the Year, and Best Male Pop Vocal Performance. The song's title is taken from a famous quote by Meher Baba. The original music video stars Robin Williams and Bill Irwin. 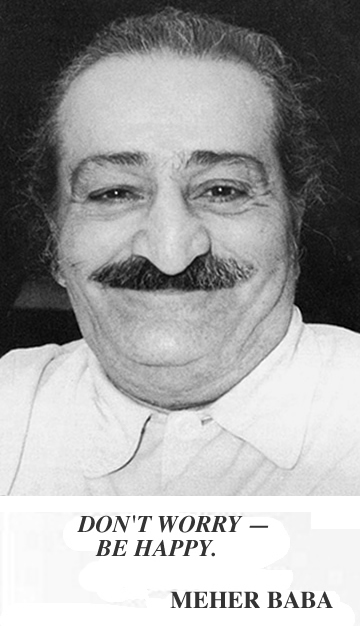 The Indian mystic and sage Meher Baba (1894–1969) often used the expression "Don't worry, be happy". In the 1960s, this expression by Baba was printed up on inspiration cards and posters of the era. In 1988, McFerrin noticed a Meher Baba poster in the apartment of the jazz band Tuck & Patti in San Francisco. Inspired by the expression's charm and simplicity, McFerrin wrote the now famous song, which was included in the soundtrack of the movie Cocktail, and became a hit single the next year. In an interview by Bruce Fessier for USA Weekend Magazine in 1988 McFerrin said, "Whenever you see a poster of Meher Baba, it usually says 'Don't worry, be happy,' which is a pretty neat philosophy in four words, I think." Plus check this link out to a t-shirt made on the poster!